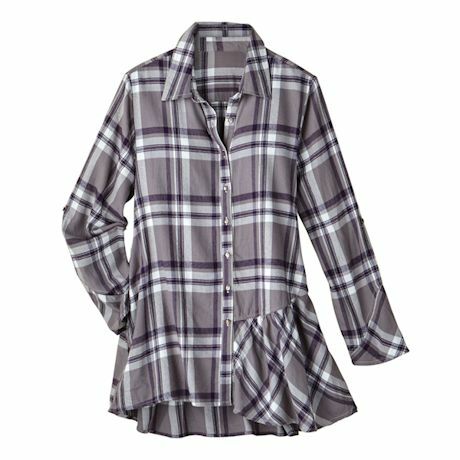 A feminine restyle of the classic plaid shirt. So many sewn-in delights in one shirt, from roll-tab sleeves to stylish side and back ruffles to a gathered back seam for fun flounce. A wonderful piece for upgrading your weekend look-and don't miss the U-shaped seam across the back as a finishing statement touch. 100% cotton. Imported. S(6-8), M(10-12), L(14-16), XL(18), 1X(18W-20W), 2X(22W-24W); 34"L.